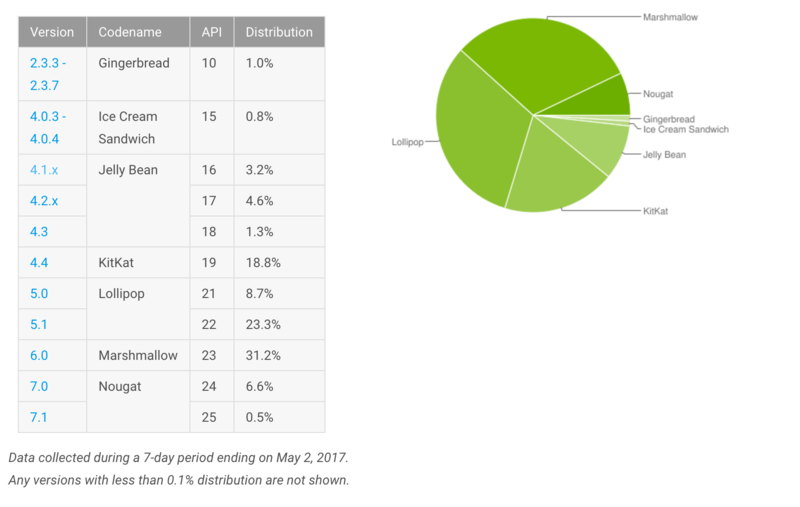 Google has released their monthly Android Distribution Report for May and it shows that Android Nougat continues to grow. The latest version of Android accounted for 7.1% of devices that hit the Google Play Store in the week ending May 2, 2017. That is up 2.2% from the April report. While it is still not ideal to have the latest-and-greatest version at sub-10%, Nougat has continued to grow steadily over the past several months. This, of course, has been helped by the larger number of devices either getting updated to Nougat or new devices like the LG G6 and Samsung Galaxy S8 lineup shipping with it. Interestingly, both Android Marshmallow and Lollipop remained steady to the April report. Marshmallow had a 31.2% install base while Lollipop kept its 32% base. Android KitKat continued to drop, losing 1.2% in this months report. That version is down to 18.8% now while Jelly Bean and Ice Cream Sandwich both lost 1%. Gingerbread continues to hold on and actually gained .1% this month. Go figure. period as Google over the April report. That install base is up to 38.91% while Marshmallow and Lollipop both saw drops. Marshmallow saw a 2.87% drop on the site (down to 34.34% of you visiting) while Lollipop dropped to 1.16% to 13.99% of visitors. Oddly, the site also saw a .1% increase in Gingerbread traffic. You can read the full report over on the Google Developer Dashboard site to get all the details including the screen size report.